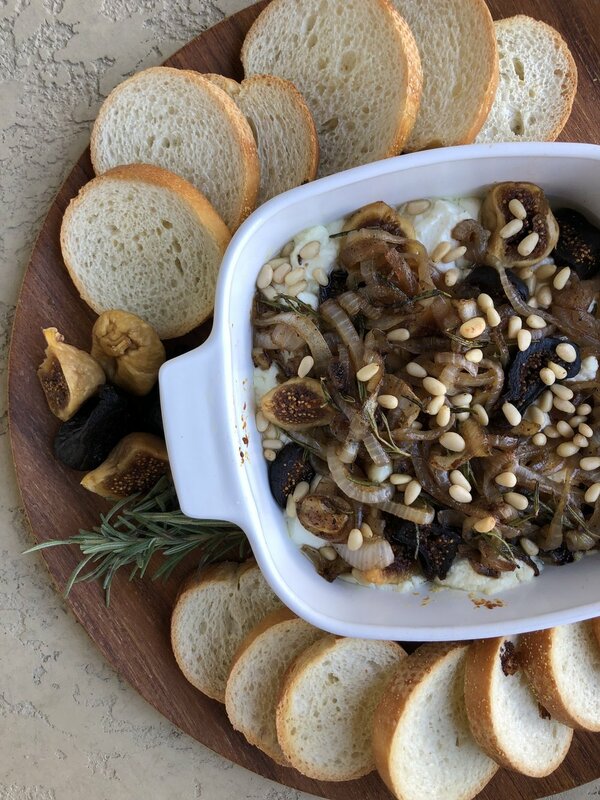 Rich, creamy, and completely addicting, this baked goat cheese appetizer will get a party started with not just visual but vocal reactions — trust me. I am so fond of the caramelized onion and goat cheese base, speckled with bits of fresh rosemary and toasted pine nuts. Dried California and Mission figs add a gorgeous color palette and a sweet bite that balances an otherwise savory starter. Dip in slice of toasted French baguette, or a green pear or apple if you’d like. You’ll find me fixing this before a Sunday football game and perhaps on Thanksgiving Day itself! 1. Preheat oven to 350 degrees. Spray a 9x9” baking dish with anti-stick spray. Crumble goat cheese into baking dish and set aside. 2. In a small saucepan, combine figs with sherry and add enough water to cover figs. Place saucepan over high heat and bring to a boil, then cover and remove from heat to plump figs. 3. Meanwhile, heat olive oil in a large skillet over medium heat. Add onion and cook until softened, about 2 minutes. Then, add garlic, rosemary, salt and pepper, and cook for 10 minutes until caramelized, stirring regularly. 4. Using a slotted spoon, remove figs from saucepan and transfer to caramelized onion mixture. Stir to combine, then spoon mixture evenly over goat cheese. Sprinkle with pine nuts and bake for 20 minutes. 5. Remove and serve immediately alongside crostini, pear or apple slices. This post is brought to you by Valley Fig Growers. Thank you for being supportive of my sponsors!